A nourishing and compelling blend of musical elements from classical to jazz with melodically weaving dreams and piercing lyrics for Earth justice. 19. Who Is Driving the Bus? This album, my second, is dedicated to all those dreaming of and working for a better world, and all beings in this great dance of life. Paul McCandless, grammy winning musician who plays on this album, described some of my music as what Debussy might have done with jazz. After my father died in 2009, I began dreaming music, a lot of it in the key of D and chord progressions containing the predictable D-A-D. Nature’s Dream was one of the first (in this recording I transposed it to the key of A which works better for the vocalist). But being clasically trained and loving more complex music, I am not sat isfied with those simple progressions. A lover of Bach, I do need the complexity to make for enjoyable listening. At first most of the dream pieces were for piano but later I received some orchestral music, most of which will appear in a future album. A small ensemble version of my piano concerto's second movement, Sueno Con Bosque Nublado (written in Costa Rica), is the fourth track here. Generally I wake up and remember a few bars or just a theme, work out what I remember at the piano and come back to fill out the piece months or years later. Five of the pieces came from such dreams. Three other pieces and the suite 24 by 8 on this album appear on my first CD “Of This Earth”; here there are more instruments: solos become duets or two piano pieces and my Mom’s 1946 song now has bass clarinet, flute, and bass along with the piano and vocals found on Of This Earth. Since 2011 when that first album was recorded, we moved to a more populated rural area and playing with a church band I have enjoyed working with a group as well as solo, and playing music from a wide range of times and places. To my earlier classical, jazz, show tunes, and earth-centered experimental jazz influences is some more contemporary music with spiritual messages. I thank all those great composers and songwriters, from Bach to Tracy Chapman, Debussy to Eric Sondheim, Beethoven to Paul Winter, so many not mentioned. I am grateful for all those who have encouraged me musically: my father Arnold Taylor, mother Priscilla Taylor, sisters Lucy, Charlotte, Hannah, brother Tom - all musical themselves, Harriet Shirvan, Jerry Gray, Ken Benshoof, Cornish School, Paul McCandless, George Husaruk, Yanahay Hooper, Michael Oberg, many others at Ukiah United Methodist Church, Margie Rice, Kenny Evans (who made recording and editing a delight) and most of all my wife and best friend Jaye Alison Moscariello for encouragement, great singing, and creation of the beautiful jacket and the paintings used in it . This is by no means a complete list; if you are not on it please know you are part of this as well. To music! Bill Taylor, Redwood Valley, November, 2018. 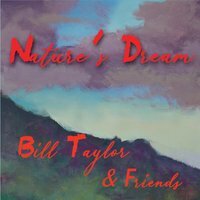 Stan Getz Dream (©2013, lyrics Jaye Alison Moscariello and Bill Taylor©2018) – Piano, Vocals, Flute, Bass Clarinet, Upright Bass. The Stan Getz in the dream, not resembling the real Stan Getz, was seated at a piano and said “I’ll teach you how to play jazz”, then played the beginning of this tune. Ode to Ludwig (©1984, 2017-8) – Piano, Violin. I composed this in Costa Rica from sketches written in the early 1980’s. Jaye said “I hear violin with this” and was fortunate to have Margie Rice play it. Seattle October/Shutters Corners (©1989, 2011) – Piano, Soprano Sax. For our 2011 CD release concert, I wrote a part for Paul McCandless. We finally recorded it in 2017. Sueno Con Bosque Nublado (©2018)– Piano, Soprano Sax, Flute, Violin, Upright Bass. The opening theme in this was from a dream and this piece is a small ensemble version of the second movement of a piano concerto I wrote in Costa Rica in January, 2018. The faster themes were inspired by the energy of San Ramon, a small vibrant city, and the windy showery cloud forest surrounding it..
Duwamish (©1982)– Piano, Flute. George Husaruk’s brilliance as a jazz flautist enlivens this piece inspired by a Seattle river that like most urban rivers needs to be cleaned up and adopted. You are invited to adopt one near you! Spanish Stairs (©1994 Paul McCandless) – Piano, Soprano Sax, Bass Clarinet. Inspired by mathematical ratios in the steps’ design, McCandless created the meditative chordal structure and melody of the piece. The monumental stairway of 135 steps is a popular landmark in Rome. Nature’s Dream (©2012) – Piano, Vocal, Flute, Soprano Sax, Upright Bass. In 2011 I had a vivid dream in which Paul McCandless was playing soprano sax, I playing piano, and Jaye singing this song. We think this would make a great national, or international, anthem. Shall we continue to think we own the beasts? Or know the truth that all of us share the feast? 24 By 8 (various; 2nd piano part ©2013) – Two Pianos. 8 pieces span a day. Dawn With Dancers, Yoga Morning, Kip Chase, Straussful Afternoon, Traffic Jamming, Evening Repose, Midnight Malarkey, Morning Of. I wrote a second piano part for Elizabeth MacDougall for a 2013 house concert. In the recording I play both parts. Every Time We Meet (©1946 Priscilla Rowe) – Piano, Vocal, Flute, Bass Clarinet, Upright Bass. Written by Bill’s mom a year before meeting his Dad. My happiness seems most complete. To walk with you down life’s street. Billy Strayhorn Dream (©2014) – Piano, Flute, Bass Clarinet, Upright Bass. In a dream a few months after the Stan Getz dream, a non-literal Billy Stayhorn showed me this tune. October 8-9 (©2018) – solo piano. I was asked to write a short piece for a September 2018 fire survivors performance of monologues about the October 9, 2017 Redwood Complex fire. Red Flag Warning, Jaye came home from residency! hot wind, Happy reunion, hot wind, romantic evening, hot wind, warm embrace, sleep, smoke or just a hot night?, sleep, Yanahay texts “Potter Valley on Fire”, red on our ridge, Fire!, how again?, who to call? Everyone we know between here and Potter, landing ember fires, propane tank booms. Who’s Driving the Bus (©2014, lyrics ©2018 Bill Taylor and Jaye Alison Moscariello) – Piano, Vocals. The intense theme and title came in a dream. The words followed a few years later. Am I cause in my life or just obeying orders? Listening to Gaia or stuck in human quarters? I Left The City For This (©2015) – Piano, Flute. Jaye asked me to write a suite of pieces to accompany her video entitled “I Left the City for THIS?”. This is the opening piece. It could be dawn leading to sunrise on a mountain. George and I trade solos and written lines.